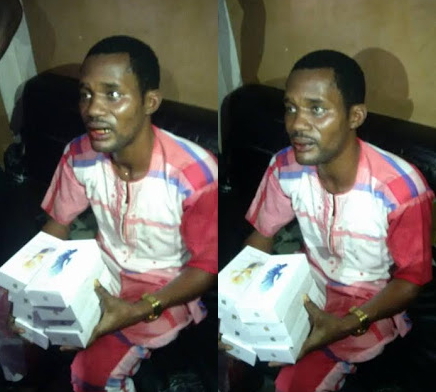 As expected,Seun Egbegbe instagram coverage today keeps rising as the former boyfriend of actress Toyin Aimakhu denies stealing the iphones he was accused of stealing earlier today at the computer village in Ikeja. was taken to the police station. Now as expected he has given his side of his story denying that he stole the phones.He explained that what happened was he went into his jeep to get the balance of the money to pay the shop attendant.As he got into his car,he saw some people running towards him calling him a thief. Now what i don't get is this,why would you take the items into the car when you haven't paid for them? Shouldn't he have left the iphones in the store and gone to his car to get the money? "My attention has been drawn to an online publication of the aforementioned. The story is pretty laughable and better left in the court of public opinion. Ordinarily, 1 do not want to join issues with the writer of the publication but I have a responsibility to set the records straight for my fans, friends and foes , in the defence of the truth. "To say the least, the news did not only grossly misinform unsuspecting public; it also portrays traces of campaign of calumny by some mercenary hirelings hell bent in destroying my name, for reasons best known to them. "Having read with keen interest the completely self-serving spirited attempt to destroy my person, it has become imperative and timely that a rejoinder is written to state the fact clearly. "I want to state here categorically and emphatically that though I was at Computer Village to address some issues, but I was never arrested for stealing 10 I phone 7s, as stated by the writer of the story, the matter has since been resolved by the Nigeria Police; and the issue of me stealing phone is devilish from the said writer. "Furthermore, It is rather unfortunate that the said writer will amount to cheap blackmail to deceive the unsuspecting public with a view of gaining cheap popularity. "It is germane to note that I am a charitable, humane, and grass root person, who has exhibited selflessness in communal service, which have used as a veritable tool for social development. "Finally, I wish to inform the general public to discard the report. I am presently at home relaxing!" So there you have it?Who are you gonna believe?Most Nigerians seem to think it must be a movie scene as they found it hard to believe a man with so much fame and influence as well as money could stoop so low.